Photographer David Matthews snapped this photo of the penumbral lunar eclipse of Nov. 28, 2012, from Cagraray Island, Philippines. He used a Canon PowerShot SX10IS digital camera and 8-inch reflector telescope. When the moon toe-dipped through part of Earth's shadow this week, the minor lunar eclipse was captured on camera by die-hard stargazers. The lunar eclipse Wednesday (Nov. 28) occurred when the moon passed through the outer region, or penumbra, of Earth's shadow. The so-called penumbral lunar eclipse was not as dazzling as a total lunar eclipse, which can turn the moon a deep blood-red hue, but even the slight dimming effect of Earth's shadow on the moon was a sight to behold for some skywatchers. "Wish you could have seen it!" Matthews told SPACE.com in an email. Photographer Rg Ferriols created this mosaic of the penumbral lunar eclipse of Nov. 28, 2012, from the Philippines to showcase the event's phases. Wednesday's penumbral lunar eclipse coincided with the full moon of November. The entire event was visible primarily from East Asia, Australia, Alaska and Hawaii, though portions were visible from western U.S. and Canada. Stargazer Kalani Pokipala watched the eclipse from Hawaii, where it was a welcome sight on a chilly night of 55 degrees Fahrenheit (12.7 Celsius). SPACE.com reader Peter Jones Dela Cruz sent in photos of the Nov. 28, 2012, penumbral lunar eclipse, taken in General Santos City, Philippines. Lunar eclipses occur when the moon passes on the opposite side of Earth from the sun and crosses through the shadow of Earth. Because the moon's orbit is slightly tilted, the alignments do not occur every month. The next lunar eclipse will be on April 25, 2013, when the moon will pass through a more substantial part of Earth's shadow in a partial eclipse. Two more penumbral lunar eclipses will occur in 2013, first on May 25 and then again on Oct. 18. There will not be a total lunar eclipse until April 15, 2014. There will also be two solar eclipses — when the moon passes between Earth and the sun, blocking the sun's disk — in 2013. An annular, or "ring of fire," solar eclipse will occur on May 10, with a so-called hybrid solar eclipse occurring Nov. 3. 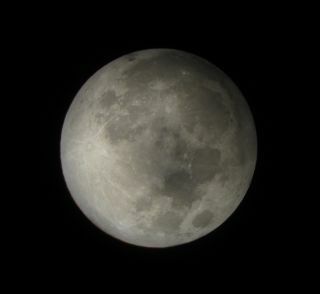 Editor's note: If you snapped photos of this week's penumbral lunar eclipse or any other night sky event and would like to share it with SPACE.com for a story or gallery, send images, comments and viewing location information to managing editor Tariq Malik at: tmalik@space.com.